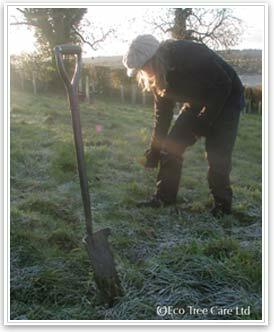 Tree planting is an ancient art and one that is most rewarding. There is something quite special about planting something that will most probably well out live you and will become the home for many creatures over its lifetime. 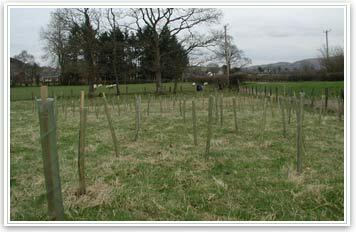 Planting a new woodland is in our consideration one of the most positive ways of contributing to the long term health and stability of of our native wildlife and habitat. 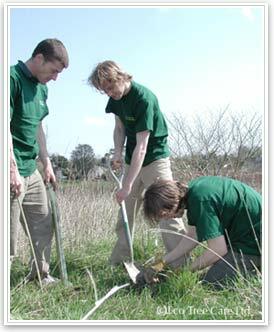 Many people joke that for successful tree planting all you need to do is dig a hole and put the tree in green side up. Well, yes, at a basic level this is it in a nutshell. But research over the past 20 years shows that there are many factors to be considered right from plant handling and supply through to on going management and aftercare, that need to be done correctly to ensure planting success. 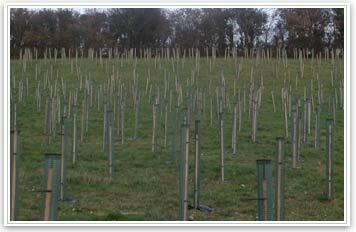 Below are photos of new woodlands that we have planted in London, Wales, Cheshire, Somerset, Essex and Hertfordshire. 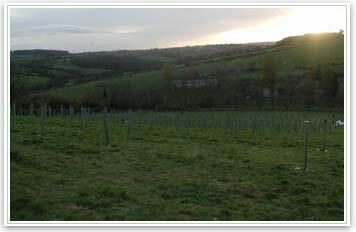 We only used trusted suppliers who grew their own trees and who dealt directly with other specialists that actually grow the trees. This way we knew that when we ordered the trees they were still in the ground. We ordered them for only a few days before planting. They were lifted the day before and dispatched the next day and we recieved them ready to be transplanted in the best of conditions. 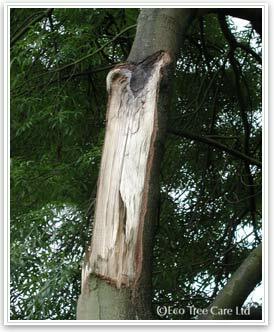 A poor supply chain is a common cause of tree mortality. 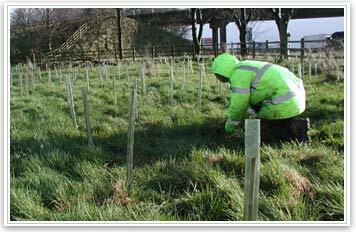 Not only can one lose trees, but also lose the time involved in planting them and re-planting replacements. Plus also losing a year or more's growth. 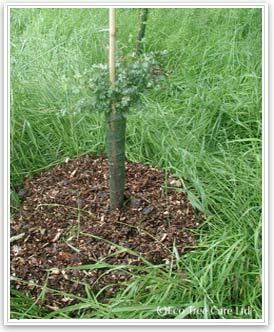 Trees are supplied cheapest as bare-root transplants during the dorment winter months. Planting needs to be well planned as the trees are supplied from the nurseries straight from the nursery beds, and should be planted as soon as possible after delivery. 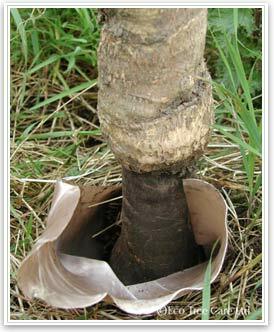 Problems can occur from rough handling and if left too long, the roots are prone to drying out (dessication) or can succumb to rot. 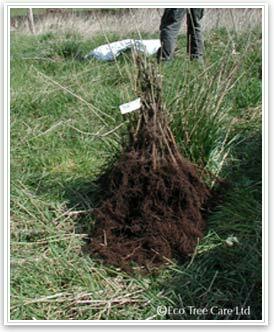 When planting it is essential that the trees are kept in their bags until they are ready to be placed gently into the holes. 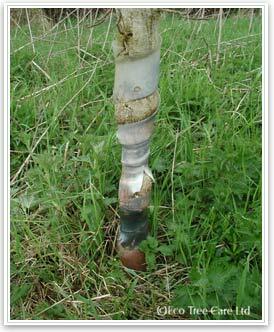 Roots can quickly dry out if exposed to the windy or dry weather conditions. 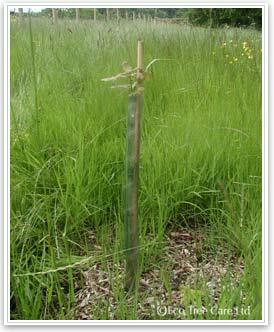 Tree shelters and canes are used to protect young trees during their intitial growing years. Advice can be given as to what is suitable for the location. 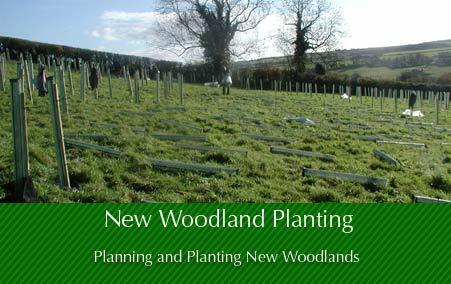 Ongoing management of planted woodlands needs to be factored into the cost and time of the project at the planning stage. Many well meaning people and organisations have planted woodlands without this consideration only to encounter problems later on, or in some cases the woodland has just been forgotton about and it's development suffered or simply failed. Many future structural problems can be rectified early on very simply. 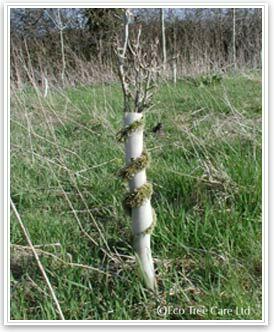 For example the removing of 'co-dominant leaders' to leave only one main growing stem that will eventually form the trunk. 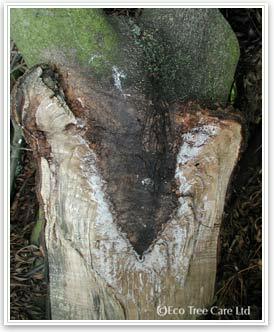 If multiple stems are allowed to develop not only does it mean the trunk will not be straight but it can also be prone to splitting out due to a phenomema called 'included bark'. 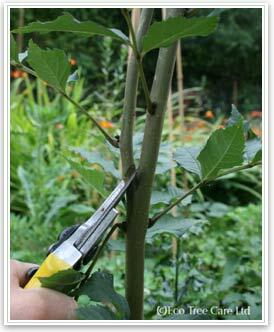 This occurs when two or more stems grow up closely together and with similarly equal vigour. The result is that as the stems put on new wood to increase their girth the gap between the stems decreases. Eventually the stems touch and start to press together. 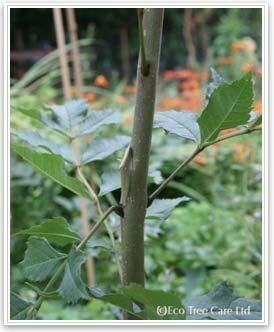 The bark on each stem progressively becomes included within this union. As the stems continue to grow they continue to add girth to themseleves and the stems are effectively pushing each other apart. The stems may grow up together for many years and the union between the two can look strong. 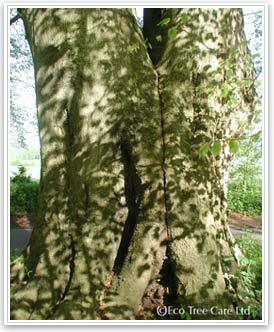 However, internally there is no physical contact with much of the stem, only two faces of bark adjacent to each other. This with the stems pushing each other apart may lead to the inevitable result that one of the stems will split away from the other. This can be such an easy problem to pre-empt and solve early on, it just takes someone to spot it and do it. 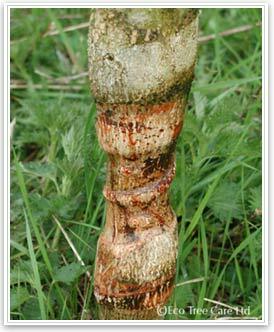 It can take seconds to prevent something that will grow into a potentially unviable or dangerous tree. 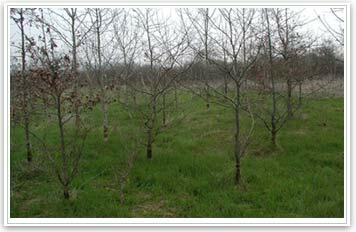 Formative pruning to correct co-dominant leaders is best done very early on in a trees life. 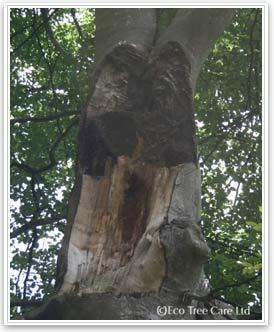 The later it is left the larger the wound and the more susceptible the tree becomes to disease and/or irreversible structural defects. Where trees, both braodlead and conifer, are grown for their future timber value formative pruning is very important in order to maximise the potential financial return. 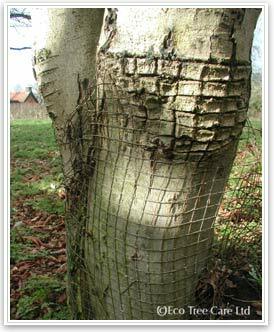 In an amenity woodland, 'odd-shaped' trees are not such a problem as long as they are safe. 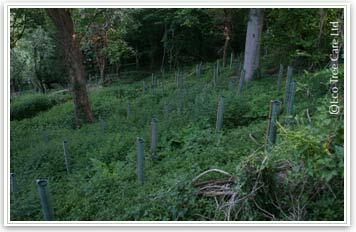 Below are examples of a poorly managed newly planted woodland, and the problems which can arise from not removing tree shelters at the right time. Obviously these young trees are now greatly weakened at their bases and have suffered restrictions in their growth in the last few years. The tree shelters should have been removed several years ago, unfortunately this 'community' woodland was planted and then forgotten about. 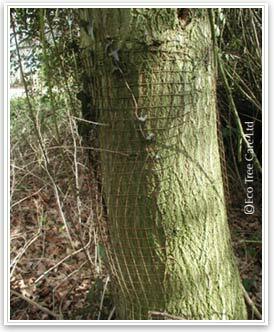 These mature trees, below, have not had their wire tree protection removed. There is now no way to remove these guards from these trees.